I'm happy that Vista or perhaps XP has a restore point feature to restore your previous known startup stage. I was trying to get an software to play the MDF and MDS image format. It turns out the MagicDisc has a very good review. From now on, I have no longer trust any softwares that are from this site www.magiciso.com. I advise you not to try MagicDisc, it is probably not going to work especially in Vista. You can try your luck but use at your own risks. You can download this MagicDisc here. I work with all the people around the world, mainly UK, Toronto, and San Jose. I used to manually calculate the time based on the time-zone difference. It is completely inefficient! This is even confusing when there is daylight savings in United State. Oh boy, I completely lost. Click here to download the free Qlock. After you install the software, the next thing is to "Create Qlock" for the places that you want. What you need to do is to right click the icon on the lower right of the task bar, then select "Create Qlock". Select the City your wants and that's it. 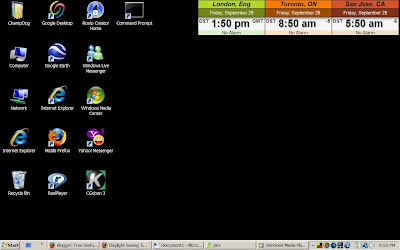 You will have something similar to my desktop. You can drag & drop and even resize the Qlock as you like. Try to play around with it and it is very user friendly. Another thing, you can also set the alarm for each Qlock. Thought it will be useful to some of the people. I seldom use the alarm features as I don't really need it. Recently, a new version (Ver 4.2) Google Earth allows you to explore the sky. So for those who are interested in astronomy, they should be very excited with this features. Are they? Anyway, I just give it a few minutes try on this feature. In short, sorry Google, "I don't like it". First, I try search "Nibiru", the tenth planet in our galaxy but no luck. Second, I try search "Earth". Third, "Sun". None of them give me any result. Ok, last chance, I search "Milky Way" our galaxy name, no search result. Ok, I give up. Perhaps I don't know how to search at at all. It is just not user friendly enough. I try zooming in and zooming out, I'm expecting something amazing like we zooming the earth. It lets me down again. It is not fun to play as compared to the Earth View. If you are really interested and all the while you study and research all different kind of galaxy, stars, I think you can give it a try. If you are just like me, and expecting something amazing like "Earth" view, an amazing zoom in and zoom out from Galaxy and Stars, let's forget about it. Some said the stellarium and celestia is better but I haven't tried it out yet. You may want to give it a try. If it is good, let me know. Recently IBM joined OpenOffice community to fight against MS Office. Guess what? Now, Google is also announced to fight against MS Office intensively. So, the question is can Microsoft Office survive? Of course, yes. Worst case, Microsoft can just make the MS office free. Even more worst case, Microsoft can just ship MS Office that comes free together with the OS. So what is the point they fight so hard against MS Office? It is not want to make him die, we all are just want to make it FREE. Don't you think so? What we consumer really care are 2 things, standardization and free. Google, IBM I fully support you guys! If you're a software developer, you probably already have your own favorite file comparison software. Even if you're not a software developer, file comparison software can be very useful. A utility to compare files and directories makes my day-to-day work very efficient. I use it to compare and merge source code, web pages, settings files and other text files. I also use it to perform code reviews and audits. Without this tool, I don't think I can survive. Yes, this is still something better than nothing. It can do most of the basic stuff. Nevertheless, the Araxis Merge is much more better. Maybe I have already get used to it but I'm still searching for the free one. So, what is your favorite file comparison software? Perhaps you can just share with us? Who is the industry leader for office tools? I bet you and me will agree, it is Microsoft Office. But who is the next generation office tools? As you know in my previous posts, I think OpenOffice is the next generation office tools. Don't you think so? Now this boost up my confident after reading the news "IBM Joins OpenOffice.org Community"
10 September 2007 -- The OpenOffice.org community today announced that IBM will be joining the community to collaborate on the development of OpenOffice.org software. IBM will be making initial code contributions that it has been developing as part of its Lotus Notes product, including accessibility enhancements, and will be making ongoing contributions to the feature richness and code quality of OpenOffice.org. Besides working with the community on the free productivity suite's software, IBM will also leverage OpenOffice.org technology in its products. Wow! Isn't this amazing? I read several software blog too, they all did mention about this news. What a amazing now the OpenOffice.org now supported by the big giant company like IBM. Having said that, Microsoft can easily just kill the OpenOffice by making Microsoft Office becomes Free. When OpenOffice becomes a threat, I bet Microsoft will be just going to make Microsoft Office becomes FREE! It probably something like Internet Explorer (IE) that comes together with the OS. But if they don't do it now or later, one day it could become too late... Will it be really too late? Remember how easy IE just kills Netscape? What is your thought? To make it simple, just download the Full version. This is what I usually do. I will basically install everything except the player -Media Player Classic. Honestly there is no point to install the player since the windows has already come with the player (Windows Media Player). Download the K-Lite Codec here. After you install, all kind of video format can be played except for Real Player format (e.g. *.rmvb). So what I normally do is to download it from www.download.com, just do a "Real Player" search. The reason I don't want to download from official real player website is because it mentions 14 days trial in the website. I have no idea why they want to do this. I thought real player is the freeware? Nevertheless, what I downloaded from download.com has no expired date so far. I have been using more than a year. It is completely free! I recently tried VLC media player and I found that it is better than K-Lite Codec. You no longer need to download Real Player anymore. You can check out my VLC review here.